Life is a journey. Come and join me as i spend moments with interesting people, visit astounding places, attend meaningful events, or just pondering things out. It has been more than two years now when I started CBC CardOps as its lone member. Few months later other members came in. 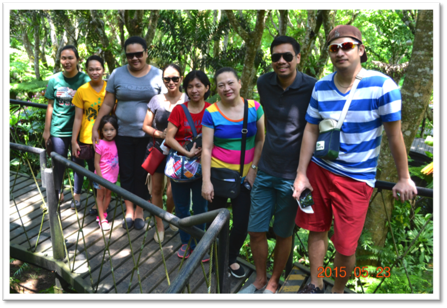 First were Chit, and then Jason, Glenna and Myra followed, then Arlene, AJ, Liza, and Ian. Latest additions this year are Krys, Shayne, MAC, and Leowel who are all newly grad when they joined our small CardOps family. 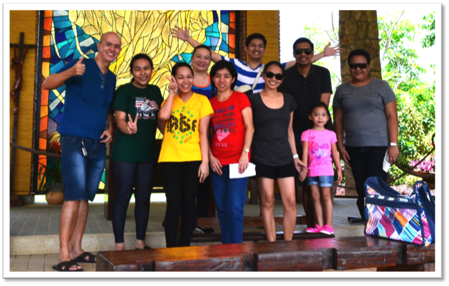 Last May 22 and 23, CBC CardOps had an overnight road trip in Tagaytay for some sort of bonding. To avoid Friday night traffic the team left Makati immediately after end of office hours. Dinner was a boodle fight at Seafood Island in Solenad2 located within Nuvali. Don’t be deceived by their name as they also serve beef and pork dishes like the glorious crispy pata (leftover by the Team) that your CorpSlave indulged in. Unfortunately, the team was hungry enough not to take a single picture at that place. 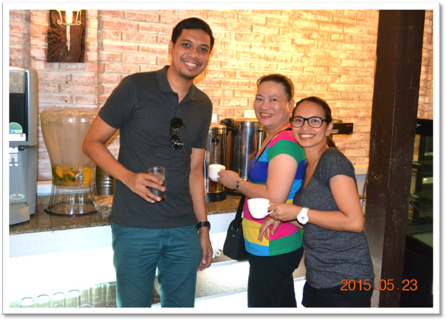 It was already past 9PM when the team proceeded to Tagaytay right after dinner. Our convoy was composed of 3 cars. Arlene, Jason and your CorpSlave were the drivers. Traffic was light so we still managed to do a brief stopover at 7-11 in Tagaytay Rotunda to buy our “juice” (Tanduay Ice and San Mig Light) and some chips. 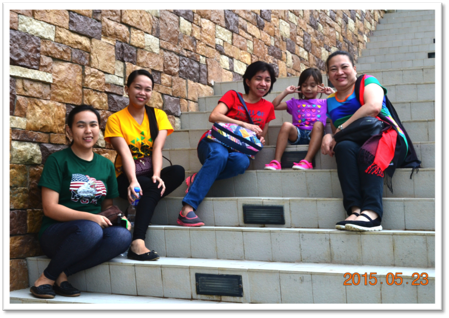 Around 11PM when we arrived at our first stop, Celestra family’s 5-storey rest house. Mrs. Celestra was gracious enough to welcome us despite our late night arrival and after fixing our things we headed at the house’s rooftop. There the team uncapped bottles of “juice” and drank the night away over spread of buchiron, Lays and Dorritos. Stories, anecdotes and experiences were shared by each one. CardOps meet almost everyday in the office but I didn’t know we still have so much to share with each other. Laughter filled the night up to early dawn. We laugh with the situations in the office, with our experiences and by making fun with office personalities. Your CorpSlave went home few minutes after 2AM while the rest of CardOps stayed in the rest house for the needed sleep. 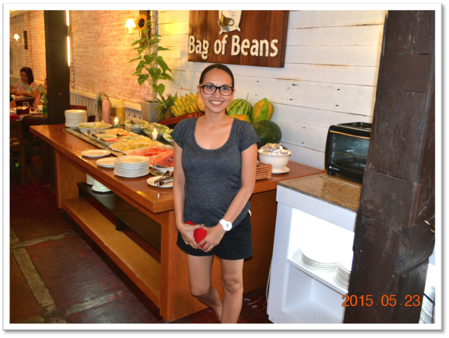 Our second day in Tagaytay started with buffet breakfast at Bag of Beans. I arrived at BoB a bit early to reserve a table for the team who arrived a few minutes later. As always, BoB never fails. Their spread is not that fancy but something that I can consider as classic favorites for breakfast. On top of that, their desserts are always something to look forward to. Their coffee is also perfect to cap a very filling meal. Most of my family celebrations were held there; birthdays, anniversaries, promotions, graduations and even a simple holiday get together. Thus, i find it appropriate for me to treat my team there. We were still filled up to the brim when we headed to Caleruega. Little did we know that the roads going there are unpaved and bumpy. On top of that, roaming around the property requires some trekking which some of us did not enjoy. Guess where your CorpSlave is. Calaruega is actually a lovely place. 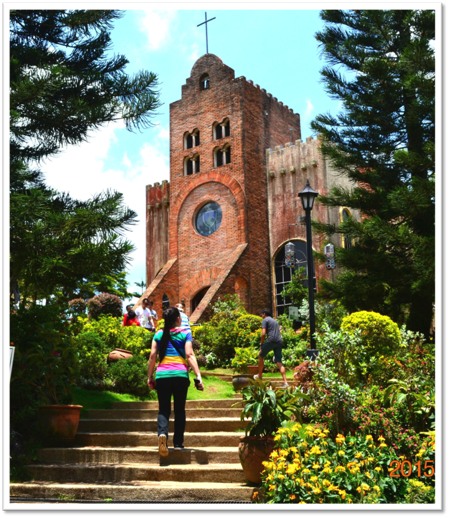 For those who want peace and tranquility, Caleruega is solemn. For those who are fond of selfie, Caleruega will never ran out of picturesque spots and nooks perfect for your Instagram. The church itself is picture perfect. It is built on a hill that overlooks the plains of Nasugbu. There’s also a hanging bridge and the open transfiguration chapel on top. 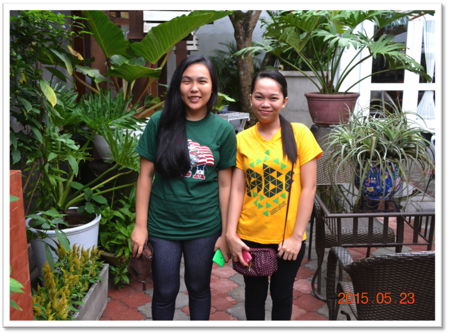 I can say that our visit to Caleruega is worth our time and effort. 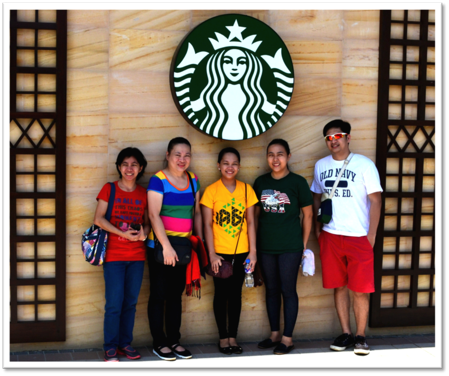 After our physically exhausting journey in hilly Caleruega we decided to make a stop at Starbucks Twin Lakes before we conclude our day out. 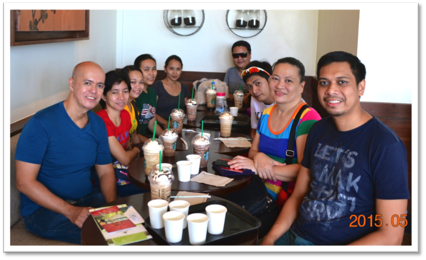 This branch of Starbucks was already included in our itinerary days before our planned trip. Advertised as “The most beautiful Starbucks in the Philippines”, surprisingly this Starbucks has nothing remarkable to offer to deserve that kind of glorification. The place is cramped and conventional. The only thing different is that their counter is located in the ground/road level while the dining area is situated at the lower level. Starbucks branch at Magallanes Square, also in Tagaytay, is far better when it comes to interior and ambiance, at the same time it offers a more commanding view of Taal Lake. CBC CardOps is a gift to me, just like my ABC CardOps. I am thankful and humbled to be their head, mentor, friend and in some ways, their father figure in our office. 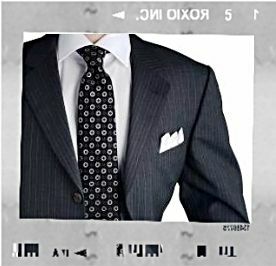 I can never tell if I will be given an opportunity to build another CardOps family again before I end my journey as Corporate Slave. I will just let destiny find its way. 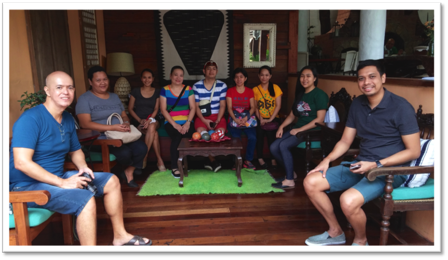 This entry was posted on October 6, 2015 by thecorpslave and tagged Bag Of Beans, Caleruega, Card Operations, Starbucks, Tagaytay.